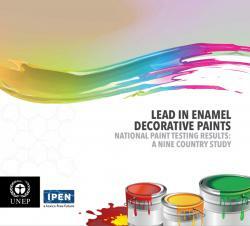 A new 2013 report from IPEN and UNEP documents high levels of lead in paint in nine countries. IPEN Participating Organizations in Argentina, Azerbaijan, Chile, Ethiopia, Ghana, Ivory Coast, Kyrgyzstan, Tunisia, and Uruguay collected paint samples for total lead content testing. With the exception of ten samples from the Ivory Coast, all of the paints purchased and tested were enamel decorative paints. See the results in the Global Report Annex 1 (below). The release of this report coincided with the International Lead Poisoning Prevention week of action, 20 - 26 October. Please read about IPEN activities during the week HERE. Rome, Italy — A UN expert committee recommended global action on pentachlorophenol – a pesticide used for wood treatment including utility poles. The Committee justified its recommendation for the Stockholm Convention due to pentachlorophenol’s persistence, bioaccumulation, long-range transport, and its toxic impacts. Governments around the world will decide on the recommendation in 2015. IPEN recently concluded its activities at the Mercury Treaty Diplomatic Conference in Kumamoto, Japan, which included side events and a press conference. For information about IPEN's work in Japan, see our "DipCon" page. Kumamoto, Japan — The signing of the world’s first international mercury treaty by delegates from more than 100 countries should spur three key actions to reduce total mercury pollution, the International NGO IPEN said. Kumamoto, Japan — The world’s first international mercury treaty should address mercury in artisanal small-scale gold mining (ASGM) by applying the lessons from the Minamata tragedy, the International NGO IPEN said today. At the conclusion of the International Minamata Symposium hosted by IPEN and Citizens Against Chemicals Pollution (CACP), IPEN presented its recently adopted Minamata Declaration on Toxic Metals to Minamata Disease Victims Group leader Shinobu Sakamoto and the larger Minamata community.